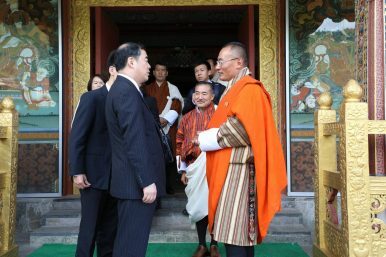 China’s vice foreign minister made a rare trip to Bhutan to discuss the bilateral relationship between the two countries. China’s Vice Foreign Minister Kong Xuanyou was in Bhutan this week for a two-day visit, marking the highest-level Chinese diplomatic interaction with the Bhutanese government since last year’s standoff between the two countries on a piece of disputed territory known as Doklam. China and Bhutan do not have formal diplomatic ties and Bhutan is one of two countries — the other being India — with whom China has outstanding and unsettled border disputes. “The two sides exchanged in-depth views on the China-Bhutan relations and border issues and reached common understandings,” Geng Shuang, a spokesperson for the Chinese Ministry of Foreign Affairs noted earlier this week in a press conference. In Bhutan, Kong met with a range of Bhutanese officials, including Prime Minister Tshering Tobgay, and the country’s King Jigme Khesar Namgyel Wangchuck. Kong’s visit to Bhutan was watched closely by India, Bhutan’s traditionally closest diplomatic partner. The two countries have close military ties and a Treaty of Friendship. Last year, following an incursion by Chinese People’s Liberation Army troops onto territory disputed between China and Bhutan, the Indian Army from the neighboring Indian state of Sikkim intervened, resulting in a 72-day-long military standoff. Throughout the standoff, Bhutan maintained a low-profile public stance. Without formal diplomatic ties, Bhutan and China normally interface diplomatically through their envoys to New Delhi. Accordingly, Chinese Ambassador to India Luo Zhaohui accompanied Kong on his trip to the country. Bhutan and China have had 24 rounds of formal border negotiations. The two countries dispute territory in three major sectors, with the Doklam sector bearing the greatest strategic importance for China. Accordingly, India is thought to have pressured the Bhutanese government in the past to resist concessions to China in the western sector, where Doklam lies. Beyond limited public messaging by the Bhutanese government — including a single tweet by the prime minister and a brief statement from the foreign ministry — and the Chinese Foreign Ministry spokesperson’s statement and accompanying official statement, little is known about the specifics of Kong’s deliberations in Bhutan. Last year’s Doklam standoff laid bare tiny Bhutan’s growing geopolitical salience in the Himalayas. Kong’s trip to the country precedes critical elections later this year for the country’s 47-member National Assembly too. Prior to his trip to Bhutan, Kong had visited New Delhi at least twice earlier this year. The Indian Express, citing sources in India, said that the Bhutanese government kept India “in the loop” on Kong’s trip.